Photo courtesy of Denver Museum of Nature & Science. On Sunday I reached some sort of odd apotheosis, presenting a series of video lectures on the Dead Sea Scrolls at Beth Evergreen. In the audience of 20, larger than I had expected, were 4 people from Idaho Springs and Georgetown, Christians invited by a biblical scholar who is a member of Beth Evergreen. That meant that in answering some of their questions, even haltingly because I don’t know the field very well, I, still an ordained Presbyterian clergy, represented a Jewish perspective to Christians on subject matter that altered both faith traditions. Weird. It could have been better. Two weeks ago I checked out the A/V setup I would use. Though I had a DVD, my laptop, a Lenovo has no DVD player. Not a problem because I could stream the lectures off the Great Courses’ website. The link to the synagogue’s wifi was fine, as was the hdmi link to the projector set in the ceiling. Rabbi Jamie and I fussed around with the sound board, unfamiliar to me, linking the computer to it. We did get the sound to work and I thought I had it down. Turns out I missed a key move on powering up the sound board. Kate and I got to Beth Evergreen at 1:15 since she had agreed to handle the food (which she did in typical splendid fashion) and I wanted to have time for tables and for making sure my setup would deliver. With some satisfaction I soon had the lecture displayed on the screen. But. No sound. Hmmm. I have plenty of time, that’s why I came early. After looking carefully at the soundboard, being sure it connected to the hdmi feed, a few people began to show up. Uh oh. I really had to get this to work. Finding the power buttons, I got the sound board to light up, but still no sound at the screen. It’s been a long time since I got sweaty palms, but I did on Sunday. Folks kept coming. I kept having no sound. It was ten till 2, the start time, and being an unreconstructed Northern European the thought of starting late literally made me sweat. I had to call Alan Rubin, a new Beth Evergreen friend, who is the A/V sage. He said he was sitting by his pool enjoying the weather. It was a blue sky, white cloud, warm but not hot, Colorado day. After some false starts, Alan isolated the problem, I poked a button and, right at 2, the sound. Whew. However. All this meant I had not had time to arrange the tables for folks to take notes, so they sat in chairs looking up at the screen. I also had not given sufficient thought to the pedagogy of the afternoon. How would we interact? What questions might prompt discussion? The fact that everyone faced front rather than seeing each other across a table made getting a conversation started difficult. Though I don’t think the audience cared, I’d hoped for a more interactive event and I didn’t facilitate that. This was the first of what we hope to be many more online type offerings by the adult education committee, so I’ll get a chance to get better at it. 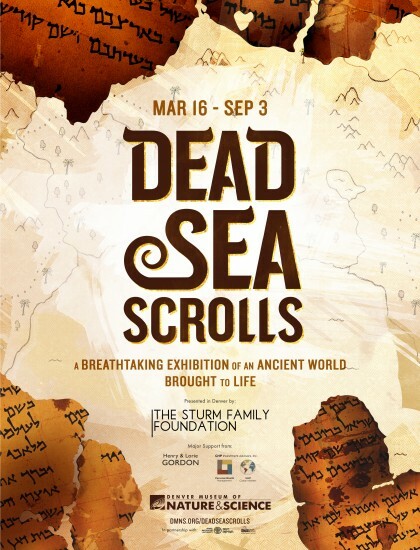 Sunday’s session anticipated a May 20th trip to the Denver Museum of Nature and Science for a tour of the Dead Sea Scroll exhibit currently there. Russ Arnold, Rabbi Jamie’s brother and professor of religion at Regis University, Denver, will lead the tour.